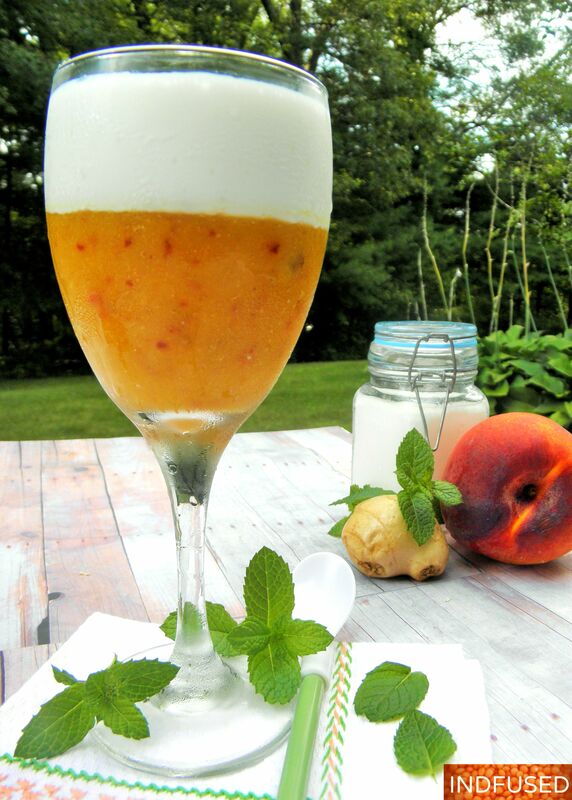 Ginger Peach Kefir Lassi with Chia! Are you enjoying the summer evenings? 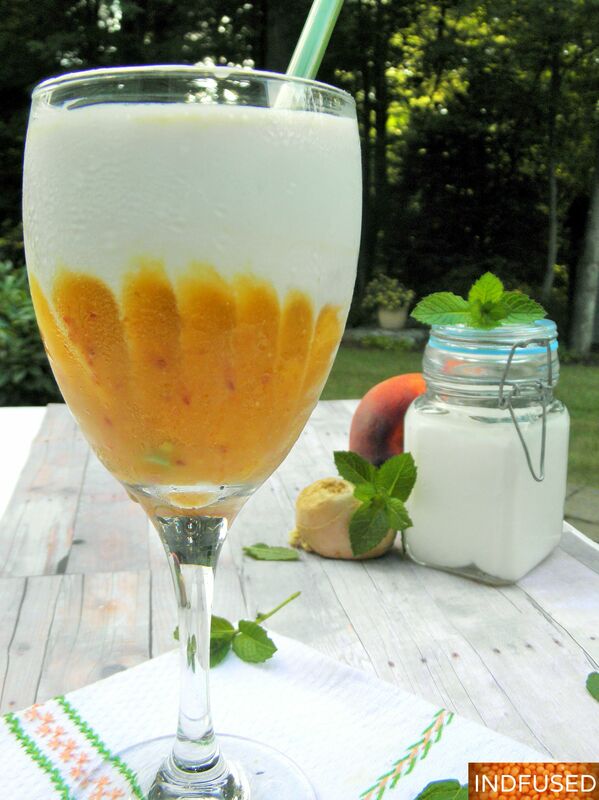 How about enjoying the sunset with this Ginger Peach Lassi in hand? Well it is a super quick and easy recipe too! I danced with joy when I tasted my experiment. I could have this for breakfast and dessert ! The markets are flooded with juicy peaches that are simply delicious. So why not combine them with the goodness of kefir, chia and ginger, right? The peaches are so sweet that I did not need to add any sugar to them. I left the skin on for extra fiber and it blended pretty well too. The chia seed powder gives it an extra pudding like texture. I like dry ginger powder here for the subtle backdrop it provides for us to enjoy the distinguished flavor of the peach. In a blender, simply add the peaches, chia seed powder, dry ginger powder and the sea salt and blend until the peaches are pureed. Pour into individual glasses and refrigerate for a few minutes. Meanwhile, rinse the blender. Add the kefir and the sugar or sweetener of your choice and blend them together. Pour on top of the pureed peach mixture. Stir layers together, creating designs and enjoy! Refrigerate peaches to have a ready to drink cool drink for the summer. You can add mango chunks to this lassi for a flavor variation too. Here’s to enjoying the summer sunsets! I love lassi! I like that you used powdered chia. I have had whole chia seed in beverages and felt like I had to chew my beverage. Sounds and looks great! I am making this tomorrow, I have whole chia seeds (black) will grind them. I love this drink. Thanks Suzanne! Do let me know how you like it. Sounds very refreshing Sandhya. Specially since it’s a hot day out here in LA. Thanks Nandini! It is in the low 90s here but I hear LA is even hotter, right? We have had a heat wave last few days. Oh wow! hope you get some respite soon. Beautiful refreshing drink for the summer time Sandhya. I’m forgetting, what is keffir again? Also, I guess I could grind up my black chia seeds, as I don’t think I’ve seen that powder and I’ve yet to make a trip to Whole Foods. Like your pictures too, very summery! Thank you so much for your kind words. Do let me know how you like it. I love peaches and this sounds like a sweet beverage which I have had left before making it alcoholic while your choice of skim milk sounds good, too. Robin,I agree that an alcoholic drink with ginger and peach is so yummy ! You’re in a kefir kick aren’t you?!?!? 😉 This looks lovely! Love peach in any form and this one is amazing combo! Looks so refreshing and great presentation dear. Thank you Kushi! I like peaches too ! Thanks Levan ! I appreciate your kind words. Love peaches and this is such a great combination with chia and kefir. Thanks Molly. With great peaches this summer, I am hooked on it.